The Sinai leopard is an little known subspecies of leopards that was given the scientific name Pantherus pardus jarvisi. 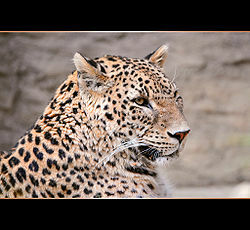 They are thought to be closely related or even a subspecies of the Persian leopard. There is no known record of them in the wild currently and are listed as critically engandered, possibly extinct. Paw of a Persian leopard. Like all leopards, the Sinai leopard is spotted with a light tan coat. Their underbellies are usually white. Their spots are called "rosettes". Leopards are exceedingly well built. Their heads are large and they have exceptionally able jaws. Their necks are large and full of muscles. This helps when they carry their prey into a tree. When climbing trees they are very aesthetic, with their long tails. A leopard can carry 5 times their weight up a tree. They can jump about 10 feet in the air. Leopards are between 3- 6.25 feet.The weight of Leopards depends on the area they live in, but they usually weigh in between 82-200 lbs. The male leopard is larger then the female. The Sinai leopard is much smaller then the African leopard. The Sinai leopard lives on the Sinai peninsula. Usually they live close to the Eilat Mountains. That is why they are sometimes called the Eilat Desert leopard. The diet of a Sinai leopard depends mainly on where they live. The color of their coat depends on this too. Male leopards have territories, generally 3-25 sq. miles. All leopards are solitary animals. Leopards mark their territory with urine. They mostly urinate on trees. Which they like to lay in and spend most of their leopard life. A males territory will overlap several female territories. When young cubs leave the nest most females will share their territory with their young girls. If they have a boy he will have to go off and make his own territory. The only predator a leopard has is humans. Humans take leopard hunting to be a sport or their fur to be so highly fashionable. Miththapala, Sriyanie; Seidensticker, John; O'Brien, Stephen J. (August 1996), 2.25.10. The World Conservation Union, 2.25.10. This page was last modified on 14 March 2010, at 20:10.